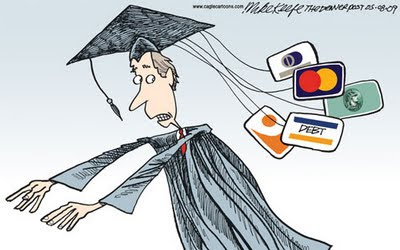 Perhaps you’re one of the millions of students who has graduated in the past few years with plenty of debt. This debt may be the result of credit card spending or simply the high cost of paying for college. To get through college, more than fifty-three of students will have borrowed for one reason or another. Having a large financial debt can cause an individual significant stress. This is especially true for graduates who may not have found a job immediately after graduation. The reality of making significantly large loan payments without a steady income creates a significant burden. You can see why so many people think that not paying back their loans could be an option. Don't get caught into this trap because not paying back your student loans will cause more trouble than it’s worth. The problem with simply choosing to ignore your responsibility to pay back your student loans is that you retain the responsibility even if you ignore your monthly statement. Said another way, the banks will come after you. This is true even if your loans are from the federal government. They will do what they can to collect on the loans. In addition, you will take a significant hit to your credit rating, eliminating your chances of ever renting or owning a home. Student loan consolidation is a great way to bring all of your loans together in a single loan, resulting in a much simpler repayment process and a lower monthly payment. You might be wondering how this is possible or if it's true. The reality is that loan consolidation has been around for a while and you should take the time to know more about it. One really good way to learn about loan consolidation is to speak with your current lenders. If you have a number of federal loans, you can speak to a representative that can explain the benefits of consolidating your student loans and determine if consolidating your student loans is a viable option for you. Consolidation often costs nothing to the borrower and can result in significant savings. Always remember that your loans are your responsibility. You can significantly reduce your loan burden with the help of loan consolidation programs. The best way to learn more is to start by having a discussion with your primary lender to determine if student loan consolidation is right for you. The sooner you have the discussion and consolidate, the sooner you can begin reaping the rewards of consolidation which include a much easier repayment process and a lower monthly payment. Don’t hesitate. Interest rates are at an all time low but they won’t stay there forever. Remember that through consolidation you can lock into a rate that determines you monthly payment for a long period of time. Call your lender today and begin the process of reducing your college debt. Contributed by Student Loan Consolidation Basics Blog. Thank you. The information here is invaluable. I am going to post this on http://www.twitter.com/SAVEMM. Very informative post. I hope all the students who are in debt benefit from this. Here is useful and valuable post. Student loans can be really overwhelming. Most people don't exit college and immediately get a fantastic job. Debt settlement companies, like Deans of Debt can really help. Student debt consolidation loan means having the multiple student loans replaced with a single loan with a lower monthly payment scheme to be paid over a longer repayment period. Though a student debt consolidation loan is beneficial, it is important to know its pros and cons before signing up for one. The huge students’ loans have an impact on your future decisions and on your credit history. So make it a point to have your student loan debt not exceed 8% of your income to get a good credit history. Thanks for sharing post it is really helpful for student. The information is really informative. modifying the terms of your mortgage loan. Hello, it's a nice postlong term installment loans, long term installment payday loans, long term installment loans online.